On February 25-26, NIRS held its Fourth Annual Retirement Policy Conference, “Retirement Insecurity: Can We Meet the Generational and Global Challenges?” in Washington, D.C.
Nearly 200 retirement leaders examined key questions: What are the pragmatic policy solutions to mitigate both the immediate and long term retirement crises? What is the global outlook? What lessons and solutions from other nations can we bring to bear in the U.S.? Did you miss the event? Watch selected portions via the webcast here. Dr. Brian Perlman, Partner, Greenwald & Associates Download conference Powerpoint here. Dr. Eric Kingson, Professor of Social Work, Center for Policy Research, Syracuse University Download conference Powerpoint here. 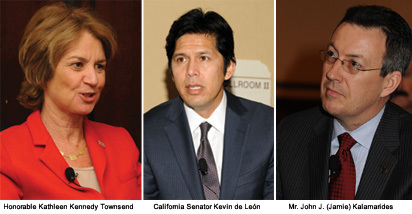 Senator Kevin de León, California State Senator, 22nd District, Download conference handout here. Dr. Sylvester Schieber, Former chairman of the Social Security Advisory Board and Author, The Predictable Surprise: The Unraveling of the U.S. Retirement System, Download conference Powerpoint here. John J. (Jamie) Kalamarides, CEO, Prudential Bank & Trust, FSB and Senior Vice President, Institutional Investment Solutions, Prudential Retirement, Download conference Powerpoint here. At the conference, NIRS released its 2013 Opinion Research Report, “Pensions & Retirement Security 2013: A Roadmap for Policy Makers”. Learn more here.